Basic Arranging System. Perfect Arrangements Every Time! It takes just minutes to create beautiful floral arrangements with this uniqye system. Seven glass vases are permanently arranged to create a perfect bouquet when all the stems are cut to the same length. Fill the seven vases with water for fresh stems, or sand for dried or silk materials. It can also be used to root cuttings of your favorite plants to share with friends. The floral seven can be used by itself for smaller flower arrangements. For large arrangements, get the Deluxe Version, a three piece system that features this product as the top portion. 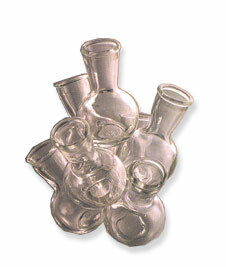 This glass, seven vase system creates perfect, professional quality floral arrangements every time. It's so easy to use that even a novice can create a perfect arrangement the first time. The Floral Seven is the top part to the two-part deluxe system, and it has been designed to accommodate the widest variety of floral materials available. Use fresh, silk or dried flowers, and even food to create professional looking bouquets. Whether you're an avid gardener with experience in floral arranging or a novice who is starting to experiment with flowers, there is no doubt that working with the Floral Seven will be a rewarding, fun experience. If you're looking for something larger, try the Deluxe Floral Design System. It comes with the seven vase system featured here, but you also get a larger ring of vases to use as a pedestal, and when combined, the two create much larger arrangements. The Floral Seven consists of seven glass vases permanently-placed. They are all fixed together in the perfect position, so once filled, you will have a perfect looking flower arrangement. The height and angle of each vase is perfectly thought out and positioned to achieve professional looking results in just minutes. To create a perfect bouquet in minutes use either fresh or silk flowers with the stems cut at the same length and insert them into the vases. Its just that easy to make a floral arrangement that looks so good everyone will think it came from a florist. For variety a tapered candle may he centered in the arrangement or the vases can be used to root new house plants. You are only limited by your imagination with the Floral Seven. Save Money and look like a pro. 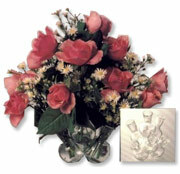 Floral Seven Automatic Flower Arranging System - An elegant addition to any home or office. Use fresh or dried flowers to create a great floral accent using this amazing tool. Order Yours Today! This was exactly what I wanted. Ordered 6 of them, and this was the best price available. Great purchase! Makes a gorgeous centerpiece and originality is key. Love it! excellent and exactly what we wanted. Available in SAE or Metric. A Ruler, Opener, Wrench, Scraper And Driver In One!